tl;dr: It’s getting more expensive to build SaaS companies and exits are weak. Here’s what that means for entrepreneurs and investors alike. Editor’s Note: This post was written by Maxwell Wessel & Shiv Sachdev of Sapphire Ventures. 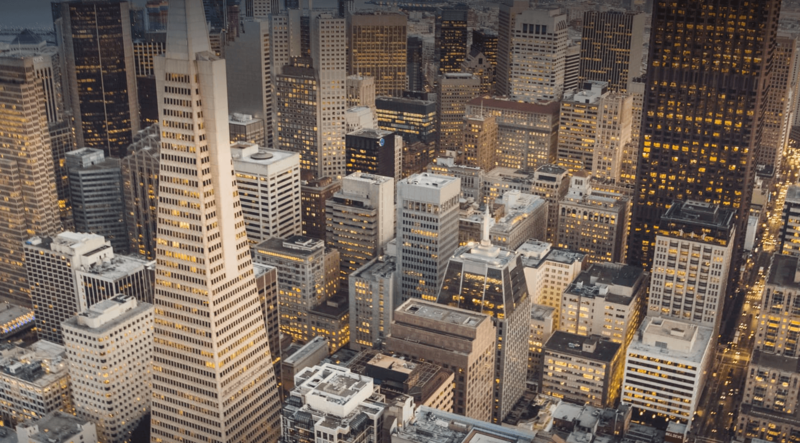 As VCs that have spent the last 20 years focused on enterprise software, we remain extremely bullish about the change cloud computing is bringing to software. However, SaaS feels like an ever more crowded market, with entrepreneurs targeting smaller areas of opportunity. The onrush of capital into the SaaS market isn’t inherently bad. One benefit of VC “bubbles” is that talent can be pulled into an industry at a rapid pace. The challenge is the aftermath. And it’s the outcome of the current gold rush that concerns us. Specifically, at Sapphire, we’re worried about two things: an increasing number of stranded assets in software markets, and the impacts those assets may have on the efficiency of the best businesses in the market. Naturally, we turned to the data to try and see if our concerns had merit. How many software companies are being funded? How many of those companies are finding their way to a public offering? How many of the funded software companies that remain private are being acquired? If growth in number of late stage financings—companies closer to cash flow neutrality, hopefully—is outpacing the growth of exits in absolute numbers, it stands to reason that the number of stranded assets in the market would be on the rise; if the relative growth in late-stage financings is outpacing the growth rate of exits, the probability of investors and entrepreneurs finding their way to positive outcomes would likely be in decline as well. That outcome might also be a realistic byproduct of our previously-mentioned entrepreneur focus on smaller areas of opportunity. The results confirm our intuition: Investment in software markets is growing far faster than exits. The data we turned to came from a mixture of private data sources, including S&P Capital IQ data concerning IPOs, and Pitchbook data for information on financings and acquisitions of companies in the software markets that received Series C or later venture investment. The results confirm our intuition: Investment in software markets is growing far faster than exits. The above chart shows the results of our analysis. 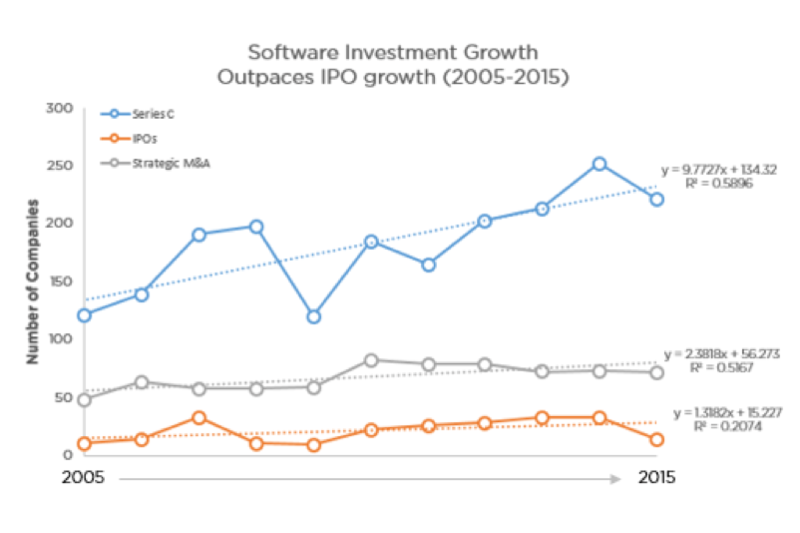 Over the past 10 years, the number of late stage financings for software companies has risen rapidly. IPOs and strategic acquisitions have grown as well, but not nearly at the same rate as venture capital has supported these SaaS companies. If the exits chronicled were large, and entrepreneurs and their investors prospered greatly on companies that did find a path to liquidity, it would be one story. But as the recent market correction has made plain, many, if not the majority of recent exits aren’t great outcomes. Our colleague Phil Orr chronicled the value retraction in detail, so we can set it aside for today. The stagnation in exits may seem counterintuitive. After all, it seems that nearly every day we hear about a major acquisition of a VC-backed company by an enormous public institution. The reality, however, is that an increasing number of these entrepreneurial success stories come from outside the traditional bastions of software success. Instead of finding their way to the likes of the Oracles, IBMs, and SAPs of the world, companies are increasingly finding their way to non-traditional buyers. 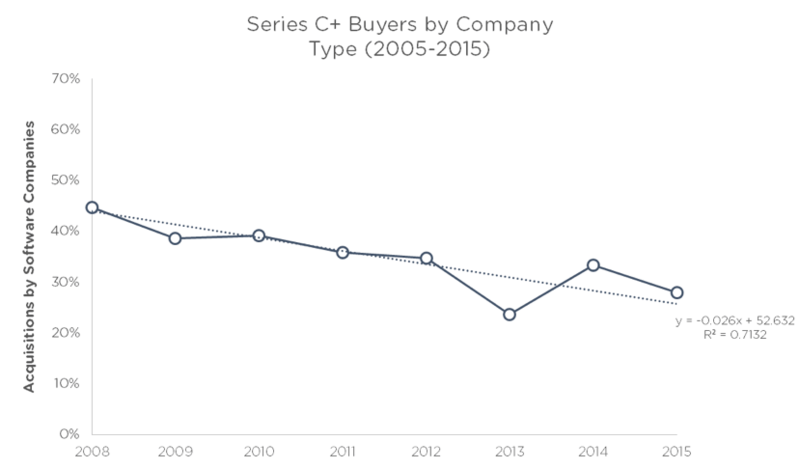 In fact, when we analyzed Crunchbase’s public data set, we found that the percentage of VC backed companies acquired by IT vendors has fallen steadily since the great recession. The most likely buyers of SaaS companies are becoming less common buyers of VC-backed companies even as funding grows. It was a CEO of a public company within our portfolio that pointed out why this is so worrisome. Every CEO has to believe their company has a shot at a good outcome. Every VC must believe the same. So regardless of how small or competitive their target markets are, the team soldiers on. That fact is compounded by more companies vying after their share of spend. Our portfolio CEO also pointed out that as spend competition increases, it’s becoming increasingly difficult to recruit and retain the best talent, increasingly expensive to market to the IT buyers thinking about a SaaS product, and increasingly difficult to differentiate from the herd. More competition for revenue, talent, retention, and differentiation is a tough mix. Michael Porter, HBS’ famed strategy professor, has long argued that increasing numbers of suppliers in a market decreases bargaining power. That would imply lower efficiency at SaaS companies. To gauge just how true that is, we turned to our longitudinal benchmarking database. 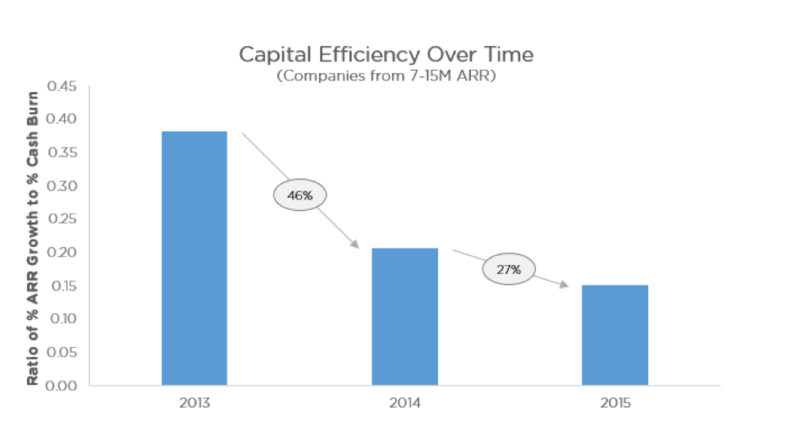 As it turns out, even for the great SaaS companies, the SaaS market is seeing decreasing capital efficiency. Our data certainly doesn’t capture the entire industry. But with more than 50 SaaS companies profiled, we are relatively confident in the trend: In a crowded, backlogged market, efficiency is dropping. With a growing liquidity backlog emerging alongside strong interest in SaaS startups, what should be expected from the companies themselves? Primarily, successful companies will still be built in SaaS markets. We’re confident in this despite venture financings outpacing the growth of IPOs and acquisitions in the world of software. IT has sustained numerous new and substantive software companies for more than thirty years. Big new businesses will be built. But we can also imagine that it will be more expensive, for the time being, to build those businesses. Since more companies are securing the late-stage resources to hire salespeople and invest in marketing, the best companies will need to spend more than they have historically to cut through the noise. Given that, efficiency levels will continue to fall on average until investor fervor wanes. Some of that waning interest will cause companies to run low on cash and stop investing in growth. Many of these businesses might be snatched up by private equity and aggregated into new software companies at large discounts to prior valuations. Some will simply stagnate. But the great ones will continue to raise capital and pursue a path toward continued growth, profitability, and ultimately public market success. It will simply cost more to achieve those goals. Where does all this leave us? In short, the world will keep turning and SaaS will continue to be a critical market in the world of venture. But even if there is gold still left in the hills, it’s clear that it is increasingly hard to find with the onrush of miners. That’s important to keep in mind for any investors just now getting excited about the market.